Trop. Subtrop. Pflanzenwelt 79: 12 (1991). Origin and Habitat: Dyckia goehringii was described in 1991 by Werner Rauh and Elvira Gross, and their occurrence was recorded in Diamantina, Minas Gerais, Brazil. However, Braum and Pereira (2004) reported that the species is endemic to Goiás, occurring in the municipality of Portelândia. Altitude range: Around 1300 metres above sea level. Habitat and ecology: Dyckia goehringii is a xerophytic saxicolous, terrestrial bromelia that grows on rocky fields in the Cerrado (Brazilian savannah) and suffers seasonally from a five months of drought every year. The plants are often difficult to be spotted among the lichens on the stony place they live. Flowering occurs almost all year round, with a peak between April and May, with maturation of fruits and subsequent seed dispersal after two to four months. 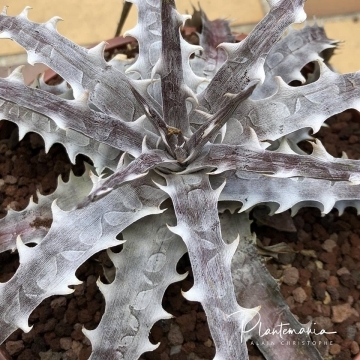 Description: Dyckia goehringii is a perennial herbaceous bromeliad distinguished by the silvery colouration on the leaves, which intensifies in the driest seasons of the year. It forms rosettes of white toothed reddish or brown evergreen foliage, covered by dense silvery lepidote indument (minuscule hairy scales). It can turn to be a show with large spines and there are two or three forms, some of which are dazzling beautiful. If one hoses D. goehringii when watering or keeps it under heavy rain the plant get bald for its scales are very lose. It produces spikes of orange flowers that appear laterally. D. goehringii is a unique species in the genus producing offsets on short stout stolons. The seed germination took place in four or five days. Roots emerges from a cleft of the cotyledonary sheath 7-8 days after germination. 2) Duarte E., Carneiro, I.F., Da Silva N.F., Guimarães N.N.R. "Physical characteristics and germination of Dyckia goehringii Gross & Rauh (Bromeliaceae) seeds under different temperatures" Pesquisa Agropecuaria Tropical 40(4): 422-429, 2010. https://www.researchgate.net/publication/286713713_Physical_characteristics_and_germination_of_Dyckia_goehringii_Gross_Rauh_Bromeliaceae_seeds_under_different_temperatures [accessed Jan 16 2018]. 3) Carneiro, M. E, I. F. Carneiro, C. B. Leite Júnior, M. M. Souza, T V. Ramos, S. A. Oliveira & R. A. Pacheco. 2007. "Caraderização e aproveitamento ornamental de espécies da família Bromeliaceae do estado de Goiás", p. 121-147. In: Prêmio CREA Goiás de Meio Ambiente: Compêndio dos trabalhos premiados. Goiânia,CREA. 4) Duarte, E. E 2007. "Caraderização, qualidade fisiológica de sementes e crescirnento inicial de Dyckia goehringii Gross & Rauh, bromélia nativa do Cerrado." Tese de Doutorado. Universidade Federal de Goiás, Goiânia. 5) Braum, E J. & E. E. Pereira. 2004. “Zur klarung der herkunft von Dyckia goehringii E. Gross & Rauh.” Die Bromelie. 3: 64-65. 6) “Morfologia de frutos e sementes e desenvolvimento pós - seminal de Dyckia goehringii Gross & Rauh (Bromeliaceae)” ttps://www.researchgate.net/publication/271235299_Morfologia_de_frutos_e_sementes_e_desenvolvimento_pos_-_seminal_de_Dyckia_goehringii_Gross_Rauh_Bromeliaceae [accessed Jan 16 2018]. 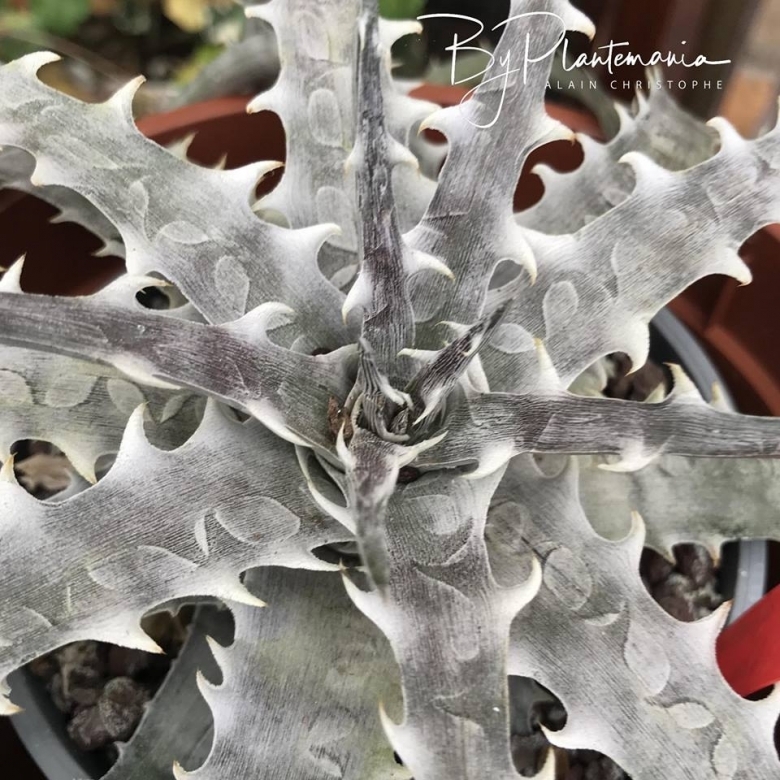 Cultivation and Propagation: Dyckia goehringii is a magnificent species and turn to be very wine and silvery. Waterings: This species enjoys a drier condition but even so do not ever allow the substrate to get torrid dry. The plant loves the humidity of the air and benefits greatly from a hight humidity content atmosphere. In cultivation this plant seems to enjoy the high umidity saturated air. But never let it under any rain as it can loose it characteristic silver colouring. Rain water is fantastic as its contents in vital elements is very high. No other water is comparable to the falling rain water. Exposition: If submitted to shading 50% with thermo-reflective mesh D. goehringii seems to shows a better growth in diameter, height, length of the largest leaf and number of leaves.